The Bloated Blowfish: "Butter helps every burn mm-hmm"
...when last we left our intrepid band of brave (foolish) adventures, they had just left The Dark Chateau and had just entered one of the Mouths of Madness and climbed up to a pillared region wherein they were confronted with a massive golden runic covered door. After many attempts to open said runic covered door (lockpicking attempts all failed) they decided to search the area and one industrious monk took a nunchaku and began tapping on each pillar in turn. A fortuitous roll uncovered a hollow spot, and shattering of said pillar commenced. Inside were two items; 1) an ancient scroll, and 2) a small golden coin. The druid it was determined could decipher the language on the coin, so as he began to read the ancient Centaurian, the coin melded to his hand and he was overtaken by a contact poison. Meanwhile, afraid the scroll had the same issues, a silken cord was offered by the elf and the monk looped it around the scroll and pulled it from it's shelf. Asked if he would catch it a hurried "no!" ensued and it was determined the ancient scroll shattered as it hit the stone floor. Meanwhile, the Druid deciphered the text and realized the coin might well open the door. While this was happening, the monk decided he wanted to scale a pillar and used the rope to lumberjack his way up to the domed (arched) ceiling. While there he touched the smooth surface, then heard the unmistakable sound of something fast approaching - as he yelled for help a bony appendage smashed him across the back and he fell unconscious some 30 feet to the stone floor below - taking 17 points of damage in the process. Black webbing anchored a bone spider as it rapidly descended to claim its prize, swaying its bony legs menacingly. It quickly began wrapping up the juicy monk when the party began nailing it with projectiles, maces and spears. A fortuitous turn for the thief, over checking out the door, for he was able to back attack the spider as it began its accent with it's prized dinner. The ruins of the scroll revealed a spell of opening, and thus the party encountered the DM's first tribute to E. Gary Gygax - a scroll laying inside a hidden compartment that would, if read, open said compartment. The coin it turned out could be used to open the door, since the outer edge of the coin turned independently from the rest. The thief, having seen similar coins in his journeys in his home city of Haven, quickly opened the massive doors. The passage beyond extended downward to a simple stone door, which didn't open but pivoted on its axis, and thus the party spend some time deciding that the door might well lead to 2 different areas when opened. After deciding, they pushed right and a room beyond appeared - not fully happy with this result they turned the door the other way and suddenly a rumbling was heard from behind. The massive golden doors had closed, trapping them within. The thief quickly surmised "We can only exit by going forward". Four dwarves and six gnomes lived within the massive cathedral like room, and the party quickly was invited to dinner. The elf proffered a single gp into the burning brazier when asked to do so, but the heavy mutton-loving human fighter quickly started a short brawl when he offered only to eat the food for free, or kill them all. A single dwarvish axe descended and the first critical was felt on the human's right arm. His brother, not too bright himself, quickly stuck his spear point into the fire and applied the red-hot tip to his brother's arm, Saxon fainted from the excruciating pain. Gandallfon, Dwarven God of Gold and Gems, arrived on his great throned seat, glittering armor and crown appearing in place. The Elf, always trying to do the right thing, quickly tossed his magical labradorite gem into the brazier (the DM, it should be noted was shocked that a gem of this magnitude was hurled into the fire). A save versus fire resulted in the worst of possible results, and the Elf, standing three feet from the brazier was hurled some 12 feet distant onto the food-laden table as the gem exploded in a fiery ball. The dull-witted fighter Angelo, once again thinking quickly - applied butter to the burned Elf - muttering something to the effect of "Butter helps every burn mm-hmm". The Elf was treated by the Dwarven Clerics, and once everyone settled down, a doorway heading North became the parties focus. A bard mysteriously appeared to join the party, and thus they sat out to explore the Storeroom level of Castle Zagyg properly. A long winding hallway led them out and around, and down to their first choice - East or continue South. As they were deciding their direction, a spider dropped from the ceiling onto the Druid, biting and paralyzing him in the process. Caught in the middle of the marching order, the fighting brothers decided to do a dash-and-smash shield attack, squishing the spider/druid in between. An arrow fired from the Elf missed badly and struck one of the druids, but order was quickly returned when the spider took a powerful whack from a shield bash. After the spider was rendered dead, the party continued South, Druid stiff as a plank. When they reached the T intersection and started East, a Gelatinous Cube was discerned heading their way. They retreated back from whence they came and waited to see what the cube would do. When it headed straight past them, oil was quickly gathered and torches proffered, and one meaty cube was quickly reduced to a nasty pile of ooze. Inside the remains was a lovely dagger, and a skull with two platinum teeth. The thief grabbed the dagger, and the Elf began to extract the teeth when the skull floated to life. Chants of Demi-Lich exploded from the players..at this point, much ado was made of the absolute safest place for a Demi-Lich to live, i.e., inside of a Gelatinous Cube. The thief attempted to strike the skull with the dagger still in his hand and as he did, both he and the skull disappeared in a puff of smoke. Down inside a pit the thief faced off against the floating skull unaware what he was about to face. Meanwhile, a group of bats flitted towards the party from behind and to the East and when bolts/arrows were released, the illusion was both busted and the trap released. The floor gave way, and 5 members fell, including the still-plank stiff Druid. The thief dodged quickly and was able to avoid all but the heaviest fighter. After destroying the reset plate inside the pit, the party was extracted leaving the skull eerily floating, looking up at the thief with that platinum-toothed grin. A Flagon Card was used to call forth a Deck of Many Things, and a few members of the party drew cards. One of the monks drew first, and instantly his body slacked, soul gone trapped on some other plane. Other cards were drawn, and a few players needed to face the next creature in single combat to gain a level, while one player (an alchemist) had to face a minor death and win - or be destroyed forever. A secondary Flagon Card was used by the alchemist Azcalaban, forcing the Elf to face the same sort of combat as retribution for asking for the Deck of Many Things to begin. The Elf didn't survive, but the Alchemist used a alembic that contained a massive fireball to defeat his opponent. The paralyzed Druid regained himself, and the party headed East, but when they came to a 20 foot hallway heading North, the Druid took off at break neck speed towards a well some 120 feet distant. Other party members pulled back a curtain revealing all sorts of spears blocking the passage - but through them they could make out a couple orcs sitting as guards. They gently closed the curtain and moved Northward. Meanwhile, the Druid proffered a nice treasure when he tossed a gp into the well, but the exuberance was short lived when a massive wolverine came charging Southward intent on claiming the nature lover as his next meal. The brothers set spears in place, and yelled to the Druid to prepare. A quick spell of animal friendship failed and a Flagon Card (whimsy style card) was used to force a change in the game. The wolverine was tasked to destroy the orcs, but that plan was forgotten when a second card gave a Monk the chance to face the wolverine in single combat - if he won he would gain a level due to drawing a card from the Deck of Many Things. The card altered the game again and the wolverine died quickly. Last rites were given to the massive beast by the bard, whom played an opal crystalline flute. The party went East again, and the Bard stepped into a room that had a partly illusionary floor. He fell some 10 feet into a pit that contained festered, maggot covered rats pouring out of the wall, and while he was rescued fairly quickly - the statement "knowing when to run is always a wise tactic" was proven to be true. Northward led to a spider infested room/alcove that the players were hesitant to explore, and they finally found some valued treasure when a box was opened to reveal five potions. (2 healing, 1 longevity, 2 unknown). The party holed up in a room with a single entrance and that's where the session ended. NOTES: I had installed Syrinscape on my laptop, and created my own sound and effects folder, which was played throughout the session as background/mood. I had installed both the Icewind Dale and Baldur's Gate soundtracks, so I had approximately 100 songs that the program played in a random, non-repeating order. 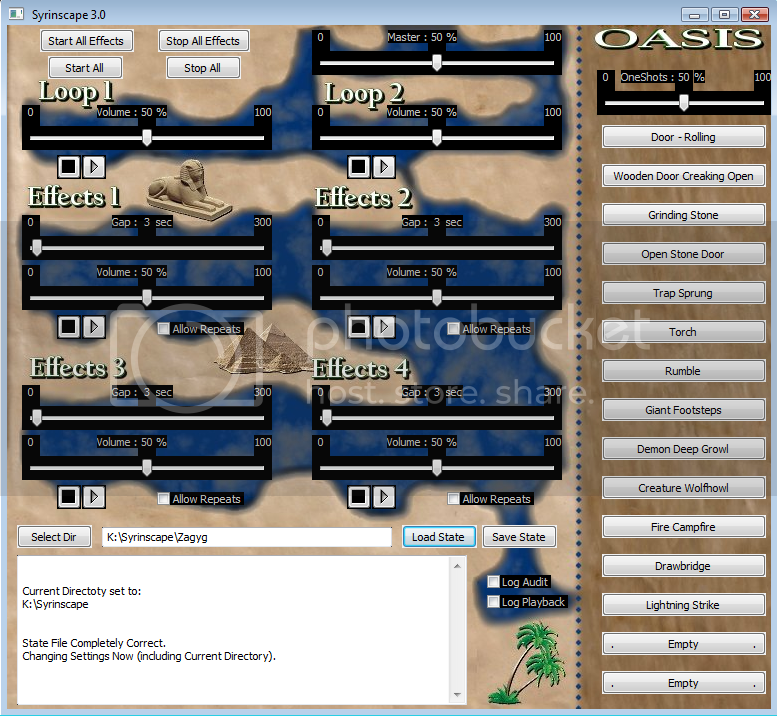 As a bonus, the program allows you to create various effects channels - such as E1, E2, and E3. Plop in sounds, and the program randomly mixes and plays them underneath the E4 music channel. lastly, the right side of the program interface allows for what it calls "one off sounds" - here I dropped in rolling stone, sprung traps, and other sounds to use for special circumstances. 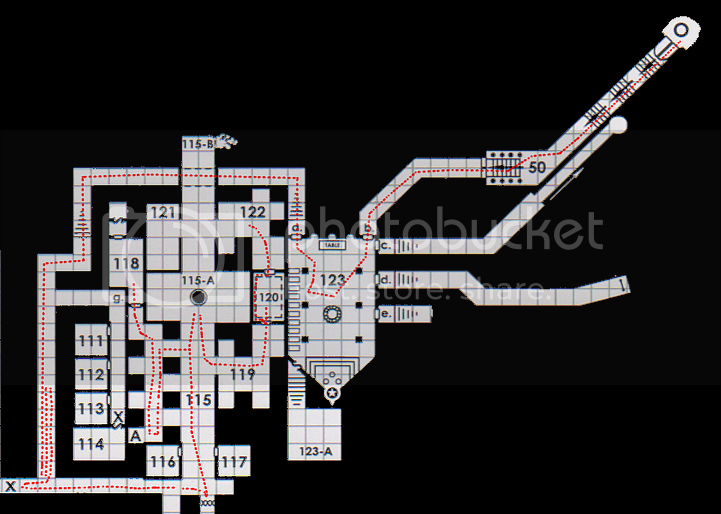 While I've added in some special encounter types of my own, as well as creating a multitude of player handouts in the form of custom doors to aid with the visual, Castle Zagyg The Storeroom level is proving to be a blast for the players and I.